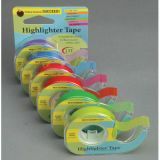 The green highlighter tape is an effective tool that helps students focus by capturing their attention with color. Colors can help students with visual learning disabilities, to focus so they can succeed! Removable, reusable, and economical. Write on it-Highlight with it-flag with it. A /forgivable/ highlighter to learn how to highlight." The orange highlighter tape is an effective tool that helps students focus by capturing their attention with color. Colors can help students with visual learning disabilities, to focus so they can succeed! Removable, reusable, and economical. Write on it-Highlight with it-flag with it. A /forgivable/ highlighter to learn how to highlight." The pink highlighter tape is an effective tool that helps students focus by capturing their attention with color. Colors can help students with visual learning disabilities, to focus so they can succeed! Removable, reusable, and economical. Write on it-Highlight with it-flag with it. A /forgivable/ highlighter to learn how to highlight." The purple highlighter tape is an effective tool that helps students focus by capturing their attention with color. Colors can help students with visual learning disabilities, to focus so they can succeed! Removable, reusable, and economical. Write on it-Highlight with it-flag with it. A /forgivable/ highlighter to learn how to highlight." The yellow highlighter tape is an effective tool that helps students focus by capturing their attention with color. Colors can help students with visual learning disabilities, to focus so they can succeed! Removable, reusable, and economical. Write on it-Highlight with it-flag with it. A /forgivable/ highlighter to learn how to highlight." 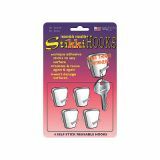 Removable Reusable Stikki Hooks, White, 4/pkg"
Stiks/ firmly to all kinds of surfaces without damage or messy adhesive residue.Removable and reusable, adhesive never dries out. waterproof, safe, and non-toxic.USE ON wallboard, cinder block, brick, plaster, paneling, pegboard, concrete, metal, glass, plastic, wallpaper, tile, & almost anything else.USE IN home, office, classroom, workshop, kitchen, laundry, hobby room, studio, dorm, locker, & almost everywhere else.White color. 4 per package." 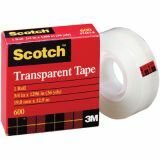 Scotch® 600 Transparent Tape, 1/2" x 1296""
The classic, glossy finish tape. A great value for general purpose wrapping, sealing and mending. Clear when applied and does not yellow. 1" core. 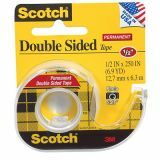 Scotch® Double Sided Permanent Tape, 1/2" x 250""
Transparent tape coated with permanent adhesive on both sides. Linerless and easy to dispense. 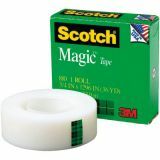 Scotch® Magic Tape No. 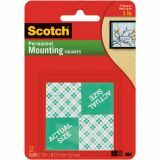 810, 1/2" x 1296""
Mend it, seal it and secure it with this permanent transparent tape. Non-yellowing tape disappears when applied, and stays invisible over time. Can be written on." 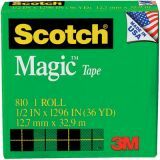 Scotch® Magic Tape No. 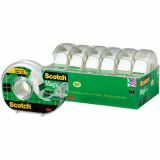 810, 3/4" x 1296""
Scotch® Magic Tape, 1/2" x 650", 6/pkg"
This 6 pack refillable dispenser has many uses. Tapes features:/ Schools and offices continually look to this original matte finish, invisible tape for their daily needs/ The tape is designed so you can write on it, making it an ideal choice for labeling and organization/ Plus, because the tape is invisible when applied, it won't show on copies and it's photo safe/ The design of the tape is ideal for permanent paper mending and splicing/ While, for safety and convenience, the tape pulls off smoothly and easily and resists splitting and tearing/ If that's not enough, it won't dry out or yellow, making it great for long-term projects/ Includes the refillable, handheld dispenser for a quick and easy application"
Self sticking on both sides for fast, easy mounting jobs, for wall mounting of pictures, decorations, and attachment of felt. 16 per package."